Straight edges, sleek finishes, soothing colors, and an abundance of natural materials like marble and stone all work together to create the serene, simplified beauty of today’s modern bath. Here’s how you can get the look in your own home. Think luxury. Think serenity. Think clean-lined, uncluttered space. This is the essence of the modern bath. It’s a look that has evolved over the years, taking advantage of the best of contemporary design in everything from faucet styles to tiles to bathtubs. Although modern baths are often pared down to their barest essentials, those elements are of the highest quality and most innovative design (consider the Dolomiti honed marble tiles, Victoria + Albert tub, and Kallista sink and tub fixtures in the bath above). And, square footage is not a deciding factor either—what matters most is how you use the space you’ve got. Even the smallest bath can capture the cutting-edge look of a modern bath. Read on to learn how to re-create the look in your own home. Muted, monochromatic color schemes are typical for modern baths, with all-white being one of the most common variations. Look closely, however, and you’ll often find that even a white bathroom has lively textures in marble and tile. Occasionally a modern bath will be interpreted with a splash of bold color—maybe red, orange, or lime green—on an accent wall or vanity. 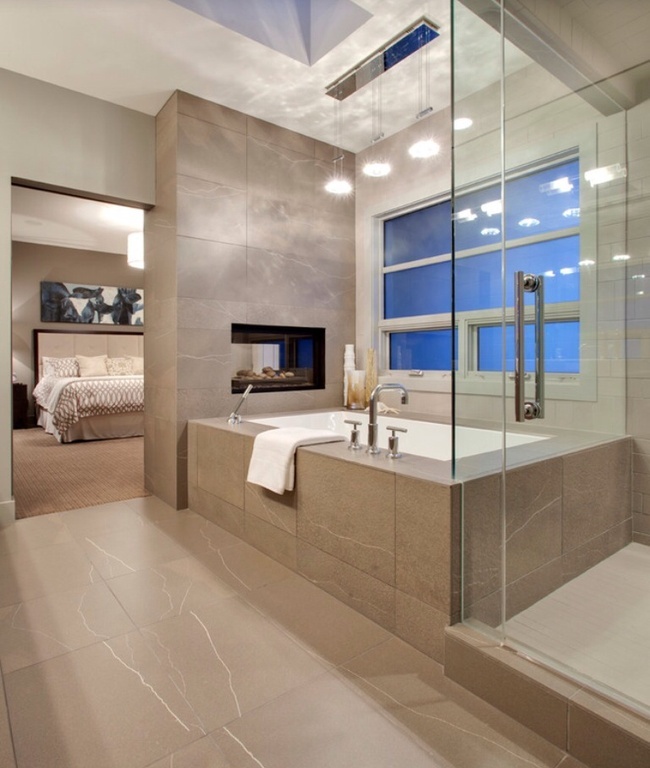 In a modern bath, surfaces are smooth and uncluttered. Natural materials, such as marble, granite, and stone, are popular choices, as are woods that may be pale in color or stained a deep brown or black, or might exhibit a strong grain pattern. Gleaming laminates are also sometimes used for a vanity or storage unit. You’ll rarely find traditional bathroom tiles in a modern bath—few white subway tiles or four-inch squares here. Instead, you may spot oversize limestone or granite tiles on the floor and, on the walls, an eye-catching arrangement of tiny one-inch glass tiles or narrow rectangles in gray or taupe. 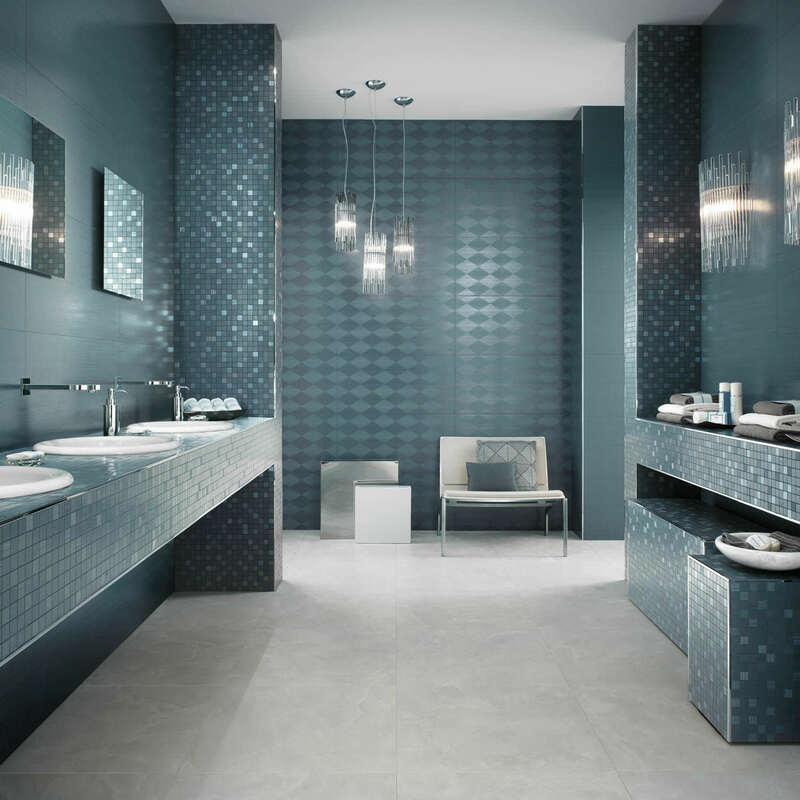 Tiles (Tiles by Five Elements) in a modern bath can blend into the overall color scheme or stand out as the single source of color in the room. There are so many variations of sinks and faucets on the market today that homeowners may find it difficult to narrow their search (Sinks by Ronbow). Many people choose a vessel sink that rests atop a vanity, while others opt for a traditional undermount model that allows a marble or granite vanity top to command full attention. Chrome, brushed nickel, and other silver finishes are usually preferred over brass. If there is space in your bathroom for a tub (Duravit Bathtubs), by all means use the opportunity to find a shape you love. 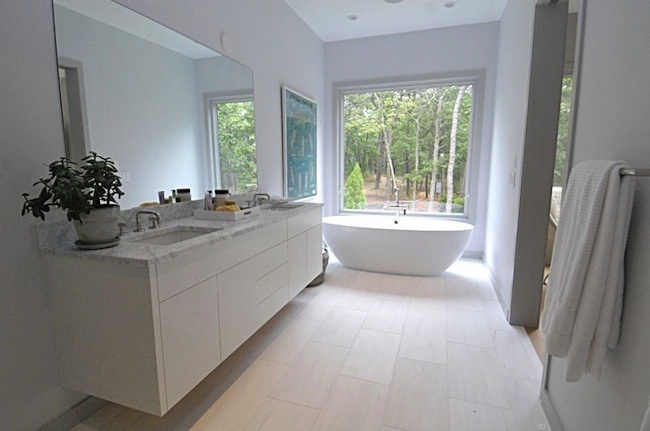 Most often, tubs in modern settings are white porcelain and extra deep, and possess a contemporary silhouette, whether gently curving or square-edged and boxy. For showers, floor-to-ceiling glass stalls are becoming commonplace, but clear-glass sliding doors are a budget-friendly alternative. Tiles that tie the floor in with the overall color scheme of the room are typical in a modern bath. Wood floors stained either a very pale or a very dark hue are also sometimes seen. When it comes to the type of tiles used, homeowners tend to play with proportion, perhaps choosing large slabs of natural marble or stone, or maybe an energetic pattern of tiny tiles that have a contemporary look, like miniature hexagons. 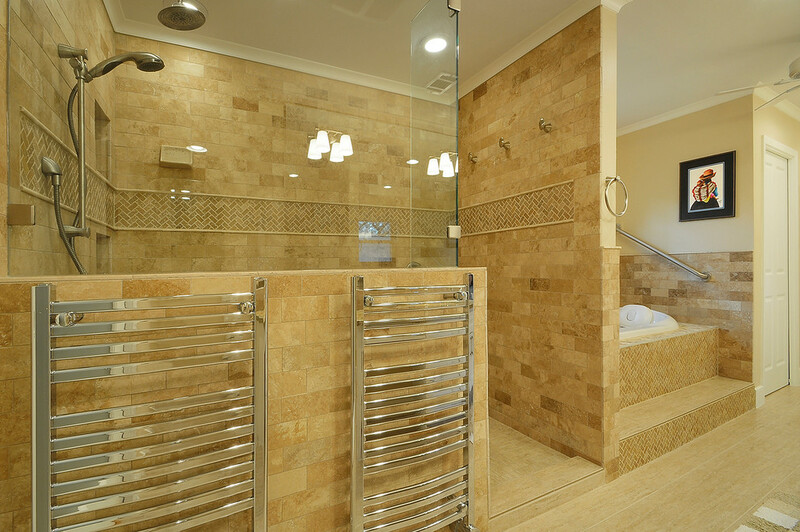 Windows in modern baths are frequently unadorned to complement the clean lines of the room. If window coverings are needed for privacy, choose a simple, high-quality Roman or roller shade in a pale color, a metallic weave, or a woven-grass texture. If your bathroom makeover is part of a new addition or major renovation, consider installing a nontraditional window shape here, such as a large square or window wall. Many modern baths feature recessed lighting to underscore the pared-down surroundings (Check out Lighting by Watermark). 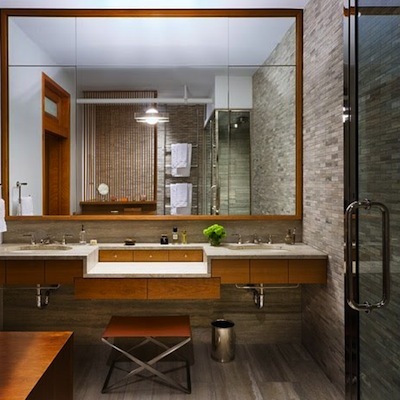 When fixtures or sconces are positioned overhead or beside a sink or vanity table, they are usually statement pieces—cutting-edge designs with unusual shapes, or fixtures with chrome or nickel finishes that echo the faucets and other details in the room. Extraneous objects look out of place in a modern bath, but a few thoughtfully selected items can provide a perfect finishing touch. Some examples include a sleek chair or stool, a single work of art like an oversize black-and-white photograph or colorful abstract print, and luxurious amenities like a wall-mounted towel warmer. Sufficient storage is a must to keep clutter at bay. Ready to start your next bathroom project? Let the Experts at PlumbTile Help! Give one of our experts a call at 1-866-369-8180 and receive a discount on your purchase! Also visit us at www.PlumbTile.com!